The kids have been off school for some time now and believe it or not I’m not going crazy! Things have been rather smooth, we’ve been enjoying our days together and finding fun things to do. 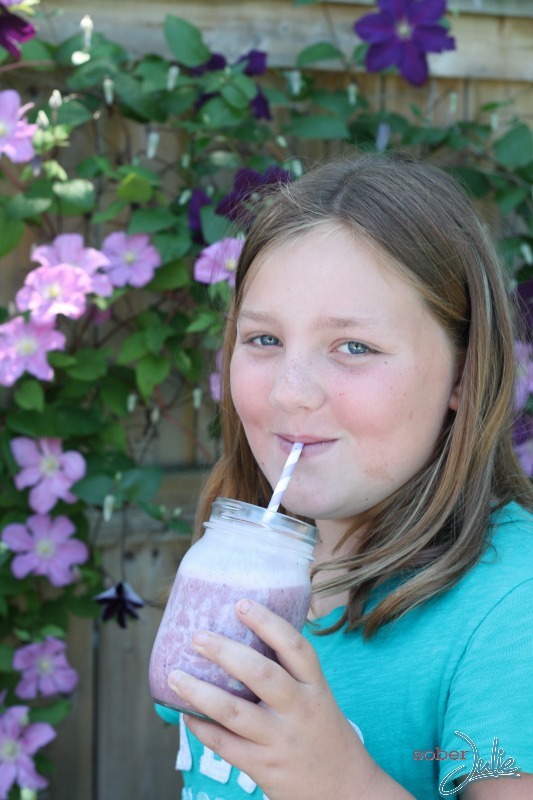 Today Sydney who is 10 spend her day developing a fantastic blueberry smothie recipe and having a photoshoot to share it with you all. In February I told you all about her love of photography and how she surprised me by making an Orange Peach Smoothie Recipe and snapping her own photos. When she told me this morning that she’d like to share a smoothie recipe on my blog how could I resist? We had some fresh blueberries and strawberries from a local farm so I gave her the go-ahead to look in the fridge and get creative. In very little time she’d come up with her recipe and was blending away as I watched on and let her do her thing. It was quite the process to watch, each fruit blend was tasted…a thoughtful pause and modifications were made. Once she had the recipe just the way she liked it best, we headed out to the backyard where she set up the shot. She was brilliant if I do say so myself! The only corrections I’ve made to these images are rotation, cropping and a bit of light correction. Sydney has a knack for this and even more importantly, it’s something she enjoys! Place the fruit and yogurt into a blender and blend at medium/high until only a few small chunks remain. Add ice cubes and blend until it reaches the consistency you desire. Pour into glasses, and serve! Note: you can substitute almond or regular milk for the yogurt. For more fantastic blueberry recipes check out my friends’ recipes: Blueberry & Quinoa Salad with Flax Lemon Vinaigrette, Homemade Blueberry Mint Tea, Homemade Blueberry Tarts, Blueberry Lemon Cupcakes, Blueberry Upside Down Cake and Blueberry Pie. WOW! What an amazing job Sydney has done! Those pictures are amazing! She certainly is talented. That recipe sounds delish. I will be making it tomorrow! Good Job! 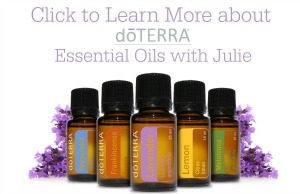 Sharing on all my pages!! WAY TO GO SYD! I love the picture of you drinking your smoothie, so beautiful!! 2. she needs to teach me how to take good pics!! I was sitting here just scrolling down through my newsfeed when suddenly this splash of pretty purple caught my eye. I kept on scrolling then scrolled back to take another look at the picture. I love blueberries and those smoothies look oh, so very good. The picture is very visually appealing as well. Very nice recipe. Enjoy the fun in the kitchen. Great job Sydney! 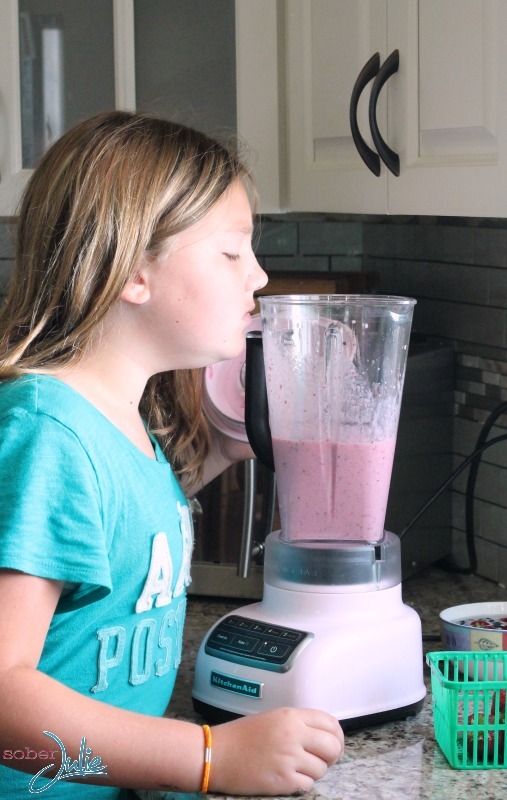 My 10 year old daughter loves to make up her own smoothies too. I’ll show this post to her. She’ll love it! 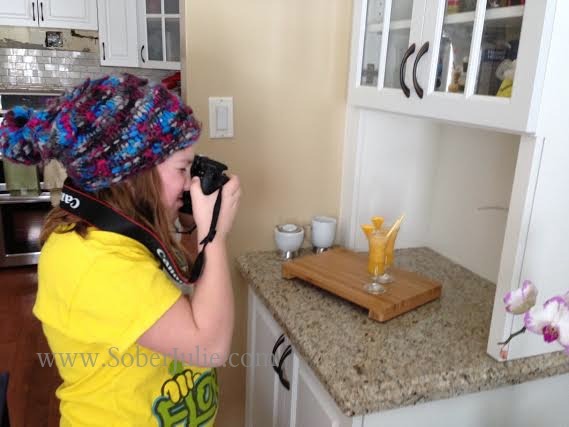 You have a budding blogger and/or photographer on your hands! She did a fantastic job! Way to go kiddo! Yum! Syndney made a delicious looking smoothie! Taking this recipe to the cottage in NW Ontario in August. The blueberries will be ripe for the picking & although we love pancakes and muffins this sounds a little healthier – thanks! Oh wow!! you have yourself one talented little lady, she has done an outstanding job,I love the picture she took of her finished product, turned out great!!! 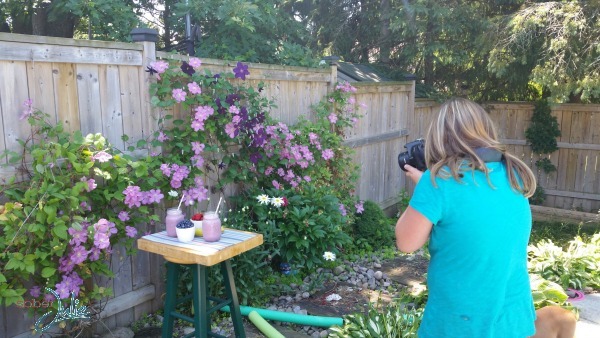 Sydney comes up with amazing recipes and ideas…love berries and the photos look great! Aren’t smoothies the best? Love blueberries, especially right now when they’re in season. Good job Sydney! Wow what a little photographer you have on your hands! 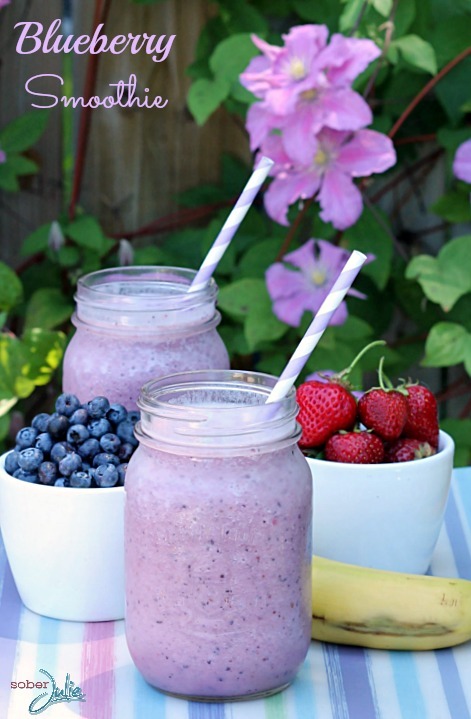 great looking smoothie! The pictures turned out amazing and the recipe sounds delicious. Thanks,this looks delicious and refreshing. I simply loves smoothies! I drink one each day in the morning! I would love to have this tomorrow. I am going to the store to get everything. It will be my first smoothie. I would love to try a blueberry smoothie. I have never had one before. I love blueberry anything. This looks great and I bet it tastes great too – well done Sydney! 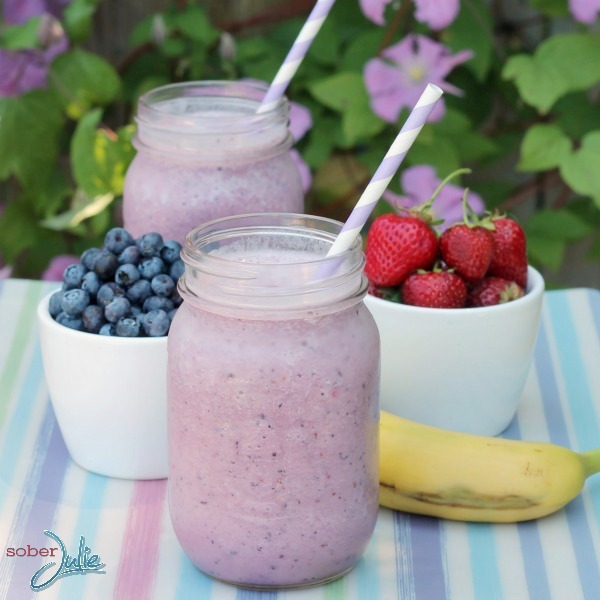 I’m a huge smoothie fan and it’s so easy to come up with creative recipes. I happen to love blueberries and strawberries together too. They taste fabulous together. Sydney that looks fantastic you are so creative and love the pics! Thanks for the recipe! Always trying new ones for the morning drinks! I really should give this recipe a try. It sounds really good as I love blueberries.